Henri Piironen raised to 150,000 in the small blind with :::Ts:::7d and Roberto Morra defended :::6h:::5d. Both players checked the :::8c:::Kc:::Td flop. On the :::9d turn, Piironen check-called a bet of 235,000 from Morra. 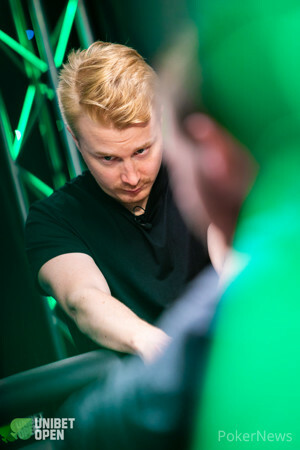 Piironen checked the :::8d river, while Morra kept up his aggression with six-high and put out a hefty bet of 700,000. Piironen went in the tank, then flicked in a calling chip after ninety seconds with the best hand. Morra was left short with just 520,000 in chips.